In less than 3 years, all three cartidges, for hot and cold and the faucet itself, needed to be replaced. This is one of the worst sets I have seen. I have seen plastic units perform better than this one. Fortunately it's the only Moen we own and soon to be replaced. Moen did send us replacement cartridges for hot and cold, I am awaiting the center unit cartridge, which I expect they will follow through and send. We've had this faucet in our kitchen for about 6 years now. I like the style and it's great with a shallow sink. But within a year one of the handles broke, and 2 years later the other handle broke off. Also, last year it began leaking at the stem. Fortunately Moen's lifetime warranty is great and new handles and a gasket kit were sent to me at no charge. I'm semi-handy so I was able to repair the faucet myself with the new parts. About two years ago we installed a Moen faucet in the kitchen sink. I love the high spout since I frequently have tall pots to fill. There is enough space between the faucet and the center that I can rinse without breaking china on the sink. Recently my faucet started dripping and I was afraid I would have to replace the entire faucet. Not so! The replacement cartridges were available at Lowes. We were able to disassemble the handles fairly easily. The old cartridges came out with a little effort, and the new slipped right in and alligned the notch with the slot easily. The handles went back on easily...and much to my surprise once the water was back on there was not a leak in sight! I have had my Moen Kitchen Sink Faucet for nearly eight years. It works! Whenever I need something replaced, I call the toll free number and the part is here in a few days. The last faucet you will buy! Have you ever thought of a product, though useful, as just practical and ordinary? Then like a 180-degree turn, your thoughts about this product are suddenly transformed from ordinary to extraordinary? Well this is precisely what I experienced when I visited some friends' home and was introduced to the **Moen Two-Handle Kitchen Faucet**. My thoughts about faucets as just ordinary were indeed transformed. It was quite amazing really. My immediate attention pounced on the detail and design of this fantastic looking multi-functional faucet. I like that there are separate handles on each side of the main unit for hot and cold water output. The convenience of not having to pull up, push down, twist to the right or to the left just to figure out the temperature control from a single-operated handle, is all here in this efficient two-handle operated design unit. I find the two-handle feature to also be particularly useful in helping to decrease water costs from not having to sometimes run water unnecessarily due to the twisting and turning for correct temperature control performed in a one-handle design. This can prove to be quite significant if budget conscious. The **Moen Two-Handle Kitchen Faucet *seems to be 'designed' with you in 'mind'. 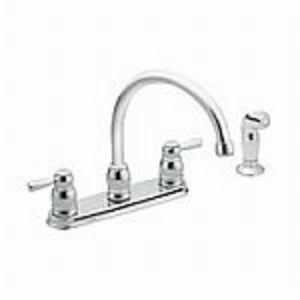 *** For those messy mishaps or when little extra touch ups are needed in cleaning around the sink, well the **Moen Faucet** got you covered because there is a sprayer conveniently on the side of the unit housing a generous hose/nozzle. Concerned about the general appearance of this product? Well, need not be. The shiny chrome finish on the unit completes the beautiful functional layout design of the faucet. Ideally, the chrome finish makes for easy cleaning and overall maintenance. I highly recommend The **Moen Two-Handle Kitchen Faucet. 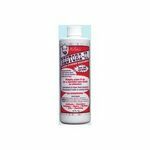 **It is an exceptional product and certainly well worth having in the home. It adds true purpose, beauty, quality, and elegance to any kitchen decor or any room of choice. Moen faucets are the best. I constantly struggled to wash larger pots because I was unable to rinse them properly. So I decided to purchase a more user friendly faucet. 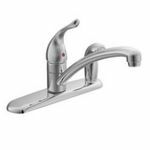 I chose the Moen two-handle faucet with a high spout. I love it. It has been several years now and we have not had any problems at all. The faucet has clean, sleek lines and is an attractive addition to my kitchen. My husband quickly and easily installed the Moen faucet. Now I have no problem washing and rinsing my pasta pot or my soup pot, nor do I have any difficulty rinsing large platters or serving bowls. The Moen faucet has stood up to a lot of use and looks as good today as it did the day it was first installed. It was more expensive than other faucets; however, it has proved itself to be worth the cost. It is almost a joy (and I emphasis almost) to wash dishes and pots. I was so pleased with my Moen kitchen faucet that we have since changed our bathroom faucets to Moen also. 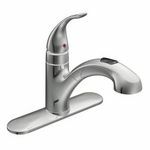 Moen two handle kitchen faucet is stylish with good finishing. It makes my kitchen look beautiful. 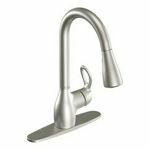 Moen two handle kitchen faucet gives my kitchen enough space and it is easy to clean. . It is high enough for large pots to fit underneath. Hope it does not require much repairs . I saw this faucet on Moen's website and fell head over heels in love with it! I was fed up with my previous kitchen faucet and was in the market for a new one when I saw this gorgeous side spray model. It was very easy to install, and my husband and kids really love using the kitchen sink now. Its finish brightens up my whole kitchen. Now, I'm thinking of replacing my counter tops because they look dull next to my new Moen 87881 faucet. Thank you, Moen! My Moen kitchen faucet is dependable and always looks good. **Moen** you ask for... We have remodeled several homes and always choose to replace the old faucets in the kitchen and baths with Moen products. We have never been disappointed in the quality or usability. When we did our lastest kitchen remodel I wanted the high-necked, curved spigot. It makes for easier placement of pots or pans in the sink for filling. I was very happy to find just the model I needed. As we remodel our baths we choose the Moen product that matches our decorating scheme. We have been using Moen products for years in our homes and when we help our children redo their homes. We expect to continue with this particular family tradition. The Moen 87881 was an awesome buy for a great faucet. 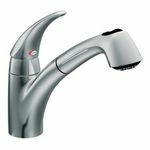 The 87881 two handle faucet was a great buy! It was cheaper than the faucets I was looking at, but in the end I choose this one because I could get my large pans under the faucet without dumping water on myself trying to get it clean. Moen also has a wonderful warranty for their products, if anything thing goes wrong you just need to call them and they will send a replacement part! I love this faucet and it has held up well against the abuse of our family!